It may be time to start talking to Pyongyang. Earlier this month, North Korean leader Kim Jong-un sent a strong and unequivocal message to the new U.S. administration — they aren’t afraid of cryptic red lines drawn by President Donald Trump on Twitter. Nor will Pyongyang be cowered by the prospect of even stronger multilateral sanctions on their small economy. In typical Kim fashion, he sent that message by launching an intermediate-range ballistic missile that traveled over 300 miles before crashing into the Sea of Japan. Pyongyang has conducted so many ballistic missile tests over the last 5 years — more than 50 since Kim Jong-un took over from his father, Kim Jong-il — that an announcement of a new one in the dead of night almost isn’t news anymore. North Korea observers in the United States, China, South Korea, Japan, and Europe have gotten to the point where they expect the North Koreans to break U.N. Security Council resolutions. These violations would be easier to gloss over if it weren’t for the reality that North Korea improves its offensive missile capability with every test. The test earlier this month wasn’t an exception to that rule; defense analysts point out that Pyongyang appeared to have used a solid fuel rocket engine, a technological development that allows missiles to be fired with very little warning. the entire cycle repeats itself as soon as the North test launches yet another missile or perhaps even a nuclear bomb underground. North Korea hawks in Washington are frustrated — and with good reason. Despite all of the condemnations and economic sanctions measures that have been sent Pyongyang’s way, Kim Jong-un defies the international community’s dictates, makes a mockery of the Security Council, and remains highly invested in ensuring his regime holds the ultimate deterrent. With each new missile test or nuclear bomb explosion, U.S.-North Korea policy is further exposed for what it is: a bipartisan failure. Just like previous U.S. administrations going back decades, the Trump administration is currently conducting its own North Korea policy assessment. Neoconservatives don’t want to wait for the process to play itself out, and many members of Congress are willing to pass additional comprehensive sanctions bills on the reclusive regime in the hope that tightening the screws on Kim’s finances will finally convince him that retaining weapons of mass destruction is more detrimental to his regime’s survival than keeping them. Unfortunately, the fact that these assumptions have proven wrong for the last two decades hasn’t led this camp to reassess its approach. The Trump administration has the freedom to pursue a fresh start to the North Korean problem, but the White House can only do so if they understand Pyongyang’s perspective, are willing to face the hard reality that is staring them in the face, and is strong enough to ignore the domestic political constraints that have prevented previous administrations from thinking and acting outside-the-box. 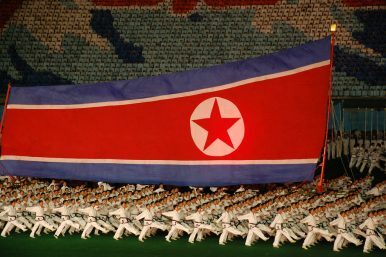 The DPRK’s nukes are about the United States: As much as the Kim dynasty would love to eventually invade South Korea, destroy its government, and reunite the Korean Peninsula under its iron grip, Korean unification isn’t the reason Pyongyang has committed so much time and resources toward becoming a nuclear weapons power. The bottom-line is that the North views nukes as the only way to deter the United States from toppling the Kim dynasty and uniting the Korean Peninsula under the democratic government of a U.S.-allied and supported South Korea. What the United States views as a reassurance policy for its allies in Northeast Asia, North Korea sees as preparation for a U.S.-orchestrated regime change campaign. As long as Kim is persuaded that Washington is building the military capability in the region to eventually overthrow his government, he will regard a nuclear weapons stockpile as the only thing deterring the United States from making the decision to act more aggressively. Sanctions have become the default option: Whenever Pyongyang does something provocative or belligerent, Washington reflexively adds more sanctions in retaliation. In many ways, this response is a prudent option to take– doing nothing isn’t an option, and using military force would be the height of irrationality, so sanctions in a way hit the sweet spot of punishing the Kim regime for violating Security Council resolutions without risking a second Korean war. But sanctions have drifted away from being part of a larger strategy to persuade or pressure North Korea to embrace denuclearization. In the past, cutting off or restricting North Korea’s trade and commerce has been used to accomplish a wider objective: serving as the stick leading to the carrot of paving the way to serious, substantive talks. When diplomacy isn’t perceived as a viable path, however, that economic pressure becomes nothing more than a temporary remedy — punishment for punishment’s sake. It is time for hard-nosed diplomacy without preconditions: Over the last eight years, the North Korea file has been managed rather than solved. The strategic patience policy of former President Barack Obama, which boiled down to refusing to discuss anything with the North Koreans unless they demonstrated in concrete ways that they were willing to denuclearize, has resulted in the exact opposite outcome that Washington hoped for. Instead of a non-nuclear Kim regime, America is staring at a Kim regime with more nuclear capability, a greater quantity of ballistic missiles with longer ranges, and the dangers of military options as a last resort are more treacherous than ever. Sitting down at the same table with one of the world’s most repressive governments is something the American foreign policy establishment isn’t especially fond of. Yet this is the same foreign policy establishment whose policies led to a nuclear North Korea in the first place. It’s also worth remembering the United States has a storied history of talking with governments Americans don’t particularly like or respect. Richard Nixon traveled to communist China in 1972, a trip that helped construct the normalization of U.S.-China relations seven years later. Ronald Reagan struck a nuclear arms control agreement with the Soviet Union, a communist behemoth that he personally despised. Bill Clinton’s administration even had some success with North Korea, arriving at an agreement that effectively froze that country’s plutonium program for eight years. Each of these negotiations wouldn’t have been possible were it not for the courage required to withstand the tremendous domestic political resistance swirling around Washington at the time. Once that political turbulence was ignored, all three U.S. presidents embraced the pragmatism necessary to develop arrangements which made the world safer. President Trump and his team should remember that diplomacy can yield enormous rewards. Nobody argues unconditional diplomacy with the North Koreans will be smooth sailing. Indeed, Kim may be at a point in time where capping his nuclear program and placing a moratorium on missile launches are the only demands he is willing to concede. The nuclear-free Korean Peninsula that has defined U.S. foreign policy for decades unfortunately may no longer be possible thanks to years of failed strategy from both Democrat and Republican administrations. But the United States won’t know what concessions it might win unless and until it gauges the thinking of North Korean officials. Talking with rogue or abusive regimes isn’t a reward for bad behavior, but rather a prerequisite for the U.S. to potentially resolve one of its most intractable national security problems.